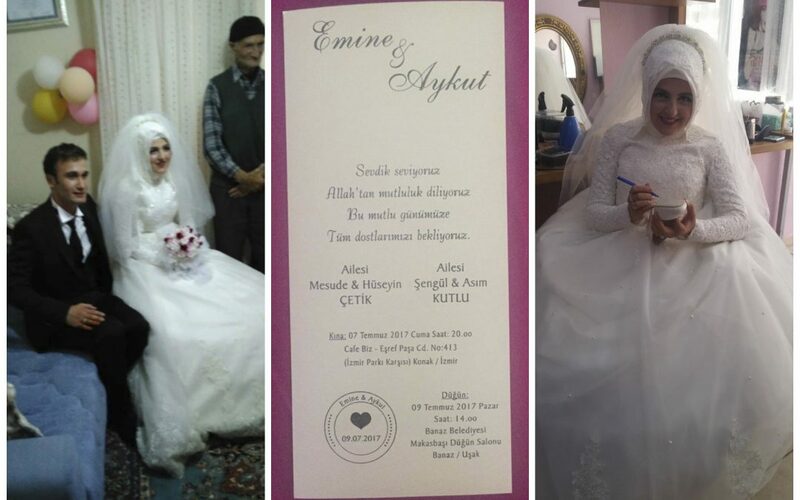 Emine Cetik and Aykut Kutlu, a soon-to-be-married couple, were stopped by police in a bridal car and detained over links to the Gulen movement while they were on their way to the wedding venue in Usak. Set to be officially married in just hours, the couple hit the road, along with a motorcade established by relatives and beloved ones, for the wedding hall located in the city center in Banaz, Usak on July 9. When they got close to the wedding venue just an hour before the ceremony, a group of gendarmerie forces stopped the bridal car, detained both the bride and the groom. According to pro-government Star daily newspaper, gendarmerie initially came for only for the groom Kutlu who has been sought as part of an investigation into the Gulen movement for some time. However, the bride Cetik was also detained on accusation that she has used ByLock, a controversial chatting application that Turkish authorities claim to be the top communication tool among followers of the Gulen movement. More than 130,000 people have lost their jobs while over 120,000 including elderly individuals, pregnant women, children and many from all walks of life have been detained over links to the group since last summer.